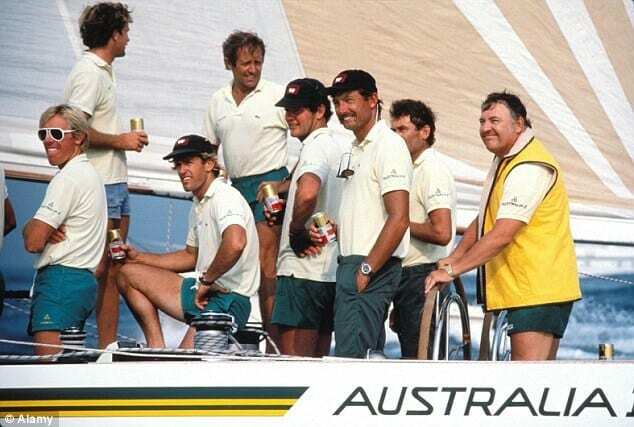 AUSTRALIA has been synonymous with sporting excellence since what feels like the dawn off time. Our great nation has sporting success flowing through its collective veins and there are several moments on the world stage that have defined us as a people. Whether it is the courage and strength to overcome the odds, a superstar dominating their sport, or the underdog coming through when it mattered most, the list of sporting achievements our people have accomplished is endless. We don’t profess to have covered every single moments, because that would be near impossible, but here are five times our sporting prowess made the nation – and often the world – stop and realise that we are a formidable athletic force. John Aloisi in the moments after he hammered home the goal that changed the course of Australian soccer history. Australia’s opinion of football changed completely after one simple spot kick. The Socceroos, our Aussie team, had not made the World Cup finals for 30 years, always falling short in the qualifiers. But, on a starlit night at Telstra Stadium in Sydney in 2005, they rewrote history. Uruguay was first to strike and it looked like there would be more heartbreak for Australia, after so many years of trying. But, after Marko Bresciano levelled the scores in the 70th minute of the match, it went into extra time. No quarter was asked and none was given in the tight extra time, with neither side producing many clear cut chances. The match would go to penalties and the rest is history. 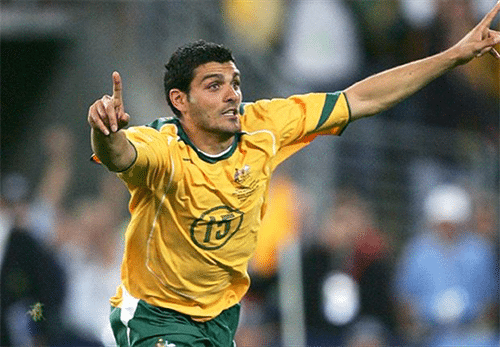 John Aloisi, a good ordinary striker that had been a fixture in the Socceroos line up, made himself a household name for eternity by delivering the match winning penalty, sending the nation into rapture. Football began to challenge AFL, cricket and NRL for air and paper time and kids every where began taking up the round ball ‘World Game’. The Aussies’ remarkable run through the World Cup, where they made the round of 16 and almost toppled eventual champions Italy, only served to fuel the rapture for the sport. Today, we have a phone provider dedicated to showing every single English Premier League game, a pay TV provider that has more soccer from Europe than we can handle and we see our local A-League on free-to-air TV. We’d say that moment was defining. Not even Stephen Bradbury can believe it. He is pictured crossing the winning line with a path of destruction behind him. The naysayers argue that Stephen Bradbury did not deserve his Olympic gold medal, but they are forgetting that he was undeniably first past the finish line. 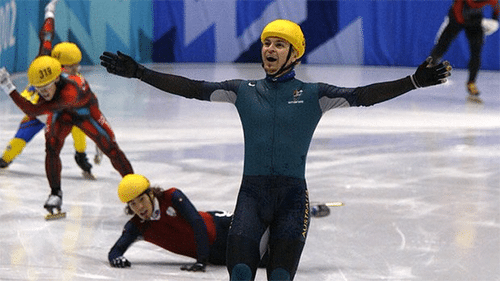 The old adage, it doesn’t matter how you win, as long as you win, was never more true when the loveable Aussie kid shocked the world by streaming past a cavalcade of fallen ice skates to claim the gold medal at the 2002 Winter Olympics in Salt Lake City. Every one knows how it happened. Bradbury flew past a bunch of blokes who crashed into each other and toppled on the final turn in the 1000m short track event. But do you remember how he qualified? So slow was Bradbury that he didn’t even make the semi final, finishing one spot out. But a disqualification gave him a spot in the semi final. And, guess what. He sat at the back and the blokes in front of him crashed, so he qualified for the final. That’s right, Bradbury’s strategy proved a masterstroke not once, but twice. It became the first gold medal from a Winter Olympics for Australia and is now part of our vernacular: “Doing a Stephen Bradbury” is achieving the most unlikeliest thing. And Bradbury was such a good bloke, we couldn’t get enough of him, appearing on reality shows like Dancing with the Stars and copping plenty of commentary gigs for winter – and summer – sports. We loved the bloke then and we still love him today, because he makes us feel like anyone can win a gold medal. Don Bradman had many days out for the Aussies. But the innings he played against England in 1930 was simply breathtaking. If there is one man who helped define our formative years as a true sporting powerhouse, it was the man simply known as ‘The Don’. Sir Donald Bradman was the greatest batsman to have ever lived. Many have tried to emulate his stunning record. All have failed. And his talents were never more on show than on the first day of cricket at Headingly way back in 1930. The Poms did not know what hit them. You reckon guys like Chris Gayle and David Warner score quickly these days? Forget about them. 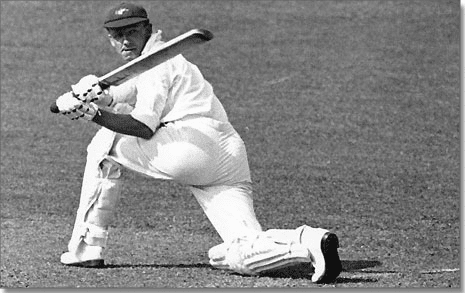 Bradman slammed 309 runs IN THE DAY, a record that has not and probably will never be caught at Test level. This wasn’t against no Mickey Mouse attack either. The Poms had beaten the Aussies 4-1 in the previous Ashes only a year earlier. This was the most dominant batsman of all-time at his most dominant. And the most surprising thing? He did not hit one ball in the air. “Day after day he cut and drove and hooked bowlers right and left, never raising the ball from the ground” Cardus wrote in Cricket All The Year. The man was simply on another plane. Of all the great bats, this guy was and probably forever will be the greatest. He is still the most revered figure in Australian cricket history and his legacy will forever stand the Test of time. 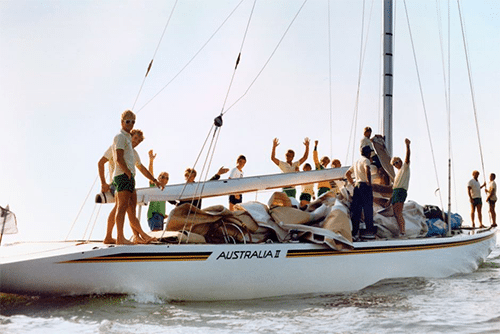 Australia II broke one of the longest standing records in sport. The Prime Minister declared it a public holiday in the hours after the historic win in the Americas Cup. An apt name for a racing yacht that shocked the world, claiming the 1983 America’s Cup. The United States had owned the event, claiming the longest winning streak in the history of sport – 132 years. If that doesn’t shape a nation, we don’t know what does. People lost control of themselves, they used it as a catch cry, a victory dance. It was something that symbolised more than sport. It symbolised Australia’s growth as a nation. We were no longer the convicts. We were the winners. And boy did we do it well. And with that, a nation had permission to celebrate what was a victory against the steepest of odds, in a sport that it could never compete in. If beating the odds isn’t truly Australian, then we don’t know what is. The little Aussie battler that made good. 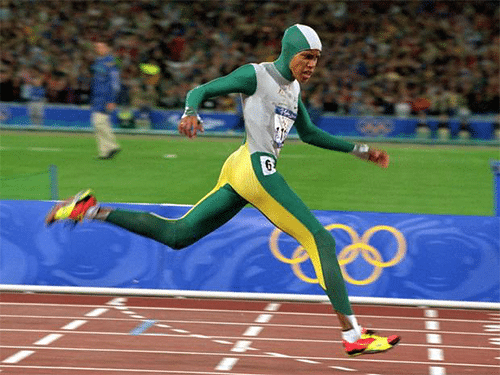 Cathy Freeman had the weight of a nation on her shoulders at the Sydney Olympics. She didn’t disappoint, winning gold in the 400m. Our greatest Olympian? Certainly our most popular. The mere mention of her name should pull at your heartstrings if you are a true blue Australian. “Our Cathy” run her way, not just to 400m gold, but into the hearts and minds of Australians. Kitted out in her now famous body suit, Freeman stood on the blocks in front of a record crowd of 112,524 people at the Sydney Olympic Park. Almost all of them were there to see her. And she did not disappoint one of them. The nation held its breath for a minute as she powered home in the 400m final, etching her name into our sporting folklore. It was Australia’s 100th Olympic gold medal and perhaps its most revered. It was a victory that brought Australians closer together. She was an athlete, of Indigenous heritage, who had a way of crossing cultural boundaries. She carried both an Australian flag and an Indigenous flag in a symbol of hope and togetherness that is still relevant today. Our Cathy was one of a kind and she is the epitome of our nation, because her achievements helped shape who we are as a people.